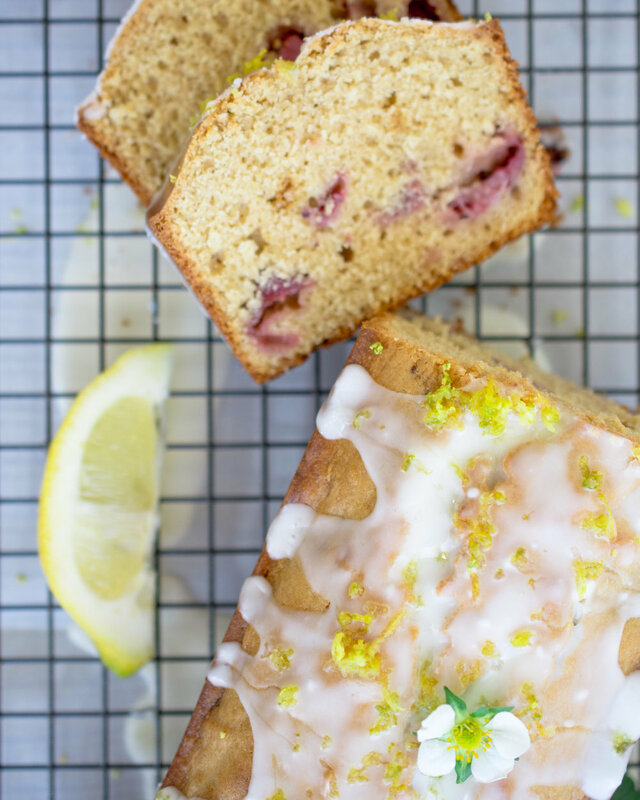 If you can’t spend your day in the California sun, you can bask in the glow of this bright Lemon Strawberry Cake. A cake this warm and bright guarantees almost instant happiness, Well, maybe I am over promising but ……..it is really good. There is that wonderful time of year where the citrus season and the berry season overlap. In my city garden, I have a prolific lemon tree and many strawberry plants. Somehow, I never seem to get bowls of strawberries at one time, but I do get good handfuls. It is a perfect situation for a lemony cake with strawberry accents. It works as a dessert and also as a breakfast treat - your choice. Snacking is allowed too. Who doesn’t love the combination of lemon and strawberries? The cake is super moist and tart thanks to the addition of fresh squeezed lemon juice, lemon zest and sour cream. Feel free to sub in Greek yoghurt for the sour cream, if you like. You should have most of the ingredients on hand, making it a good impromptu concoction. 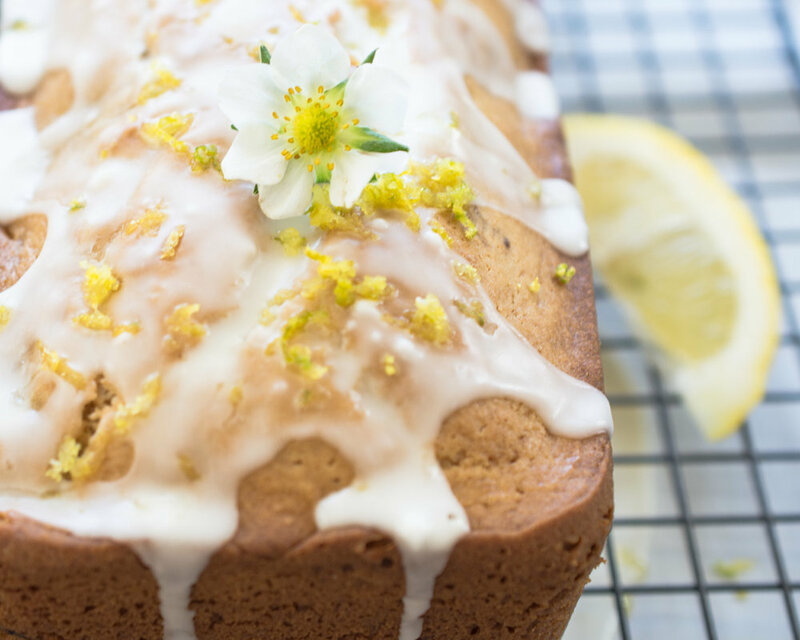 Just to make sure you get enough lemon flavor, it is topped with a lemon glaze and even more zest. The typical situation around here is more lemons than I know what to do with and strawberries that come in more slowly. Space is a premium in my little city garden, so, even though I have many strawberry plants, they are still considered a treat. Oh, we have enough to top our morning cereal and such but never baskets of them. If I want to make strawberry jam, I have to rely on the farmer’s markets. Given that our area has a market almost everyday, that is not a problem. So if you aren’t harvesting your own berries - no problem. Support your local grower! Gardening Tip. Are you growing strawberries in your garden? In California our plants do not die back in the winter but languish on. The plant can get pretty dense and less productive. 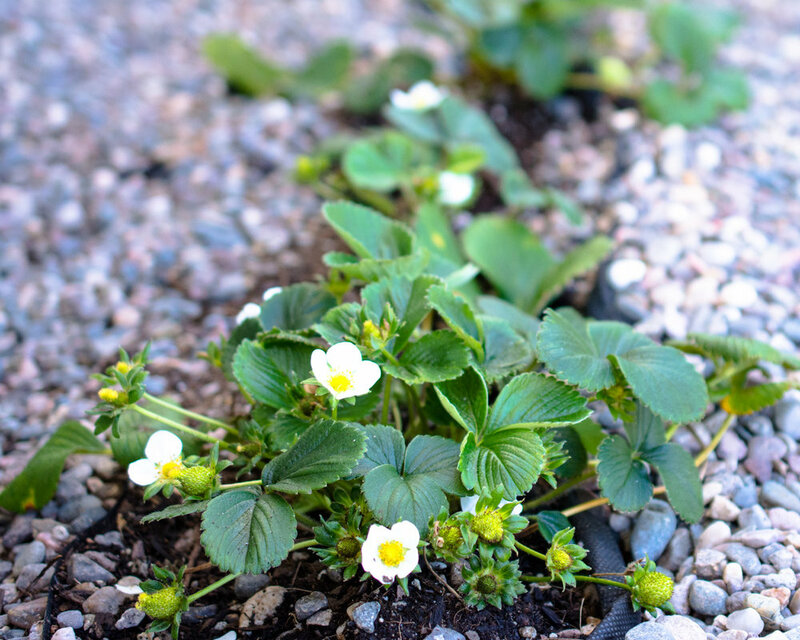 In the spring, dig up your strawberry plant and divide it. Clean up the divided plants by removing anything that does not look healthy. Replant each plant into a new hole of freshly tilled and fertilized soil. The plants will come back in force! Before mixing the cake, zest the lemons and then juice them. I used 2 lemons for this recipe, 1 for the cake and 1 for the glaze. Save a little time by zesting and juicing both lemons at the same time. Want to make the cake even prettier? Once the cake is glazed, add some fresh lemon zest and a few strawberry blossoms to the top. If you don’t want to sacrifice a strawberry blossom or two, any edible flower will do the trick. Little daisies, Johnny jump-ups and violas have yellow accents to compliment the lemon flavor. Preheat oven to 350 degrees. Spray a loaf (9"x5") pan with oil. Whisk flour, baking powder, baking soda, and salt in a small bowl. In a separate bowl, whisk eggs and brown sugar until frothy. Whisk in lemon juice, oil, sour cream, vanilla and lemon zest. Stir dry ingredients into the wet. When combined, stir in the chopped berries. Pour batter into prepared loaf pan. Bake for about 1 hour or until tester comes out clean (time will vary depending on pan size). Cool on wire rack. Make glaze by adding lemon juice to the sifted powdered sugar. Stir vigorously to remove any clumps. Pour glaze on top of cooled loaf. Garnish with lemon zest and strawberry blossoms. Eat for right out off the rack for breakfast or serve with ice cream, whipped cream and additional berries for dessert.